Jiu-jitsu.News: Ukrainians won the championship in Berlin! The popular championship "Berlin International Open IBJJF Jiu-Jitsu Championship 2018" was held in Berlin, Germany, recently. A lot of talented athletes from different countries, including fighters from Ukraine, have taken part in this competition. According to Ievgen Skyrda, the head coach of the SC “Borets” / ZR Team, "Berlin International Open IBJJF Jiu-Jitsu Championship 2018" has become one of the most intense and challenging competitions of the recent time for his team. Despite the fact that all the rivals had great sports skills, the Ukrainian fighters still managed to win prize medals. Roman Nepota had 7 fights in total, and 6 of them he finished prematurely. The athlete won gold in the purple belts category in the weight of 82 kg, and got a gold medal in absolute. Yaroslav Blazhko also became the winner in the category of purple belts but in the weight of 70 kg. 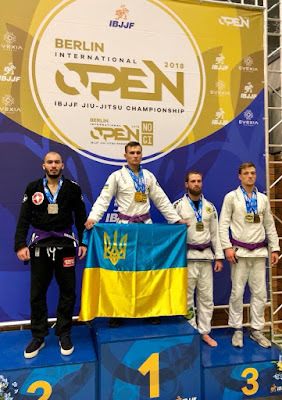 Ukrainian sportsman showed great jiu-jitsu skills in the absolute category but his opponent turned out to be more agile. Congratulations to the Ukrainian champions with deserved victories!